This article is reproduced from MillionTrees.me – the website of Death of a Million Trees with permission and minor formatting changes. They claimed that eucalyptus is far more flammable than the native landscape they wish to recreate. They claimed that wildlife needs native plants and trees. They claimed that eucalyptus is harmful to native plants and animals. They claimed that native grassland stores more carbon than forests. Based on our experience, we were immediately suspicious of the new claim that San Francisco’s eucalyptus forest is dying of drought. We know that our predominant species of eucalyptus—Tasmanian blue gum—grows successfully throughout California, all the way to the Mexican border in climates that are much hotter and drier than the Bay Area. 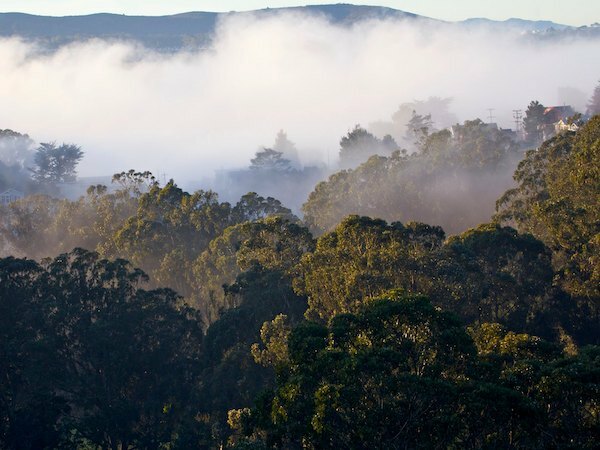 We also know that the central and north coast of California is foggy during the dry summer months, which doubles the amount of annual precipitation in the eucalyptus forest. All reliable sources of horticultural information describe blue gum eucalyptus as drought tolerant. Frankly, we couldn’t see how our eucalyptus could be dying of drought. 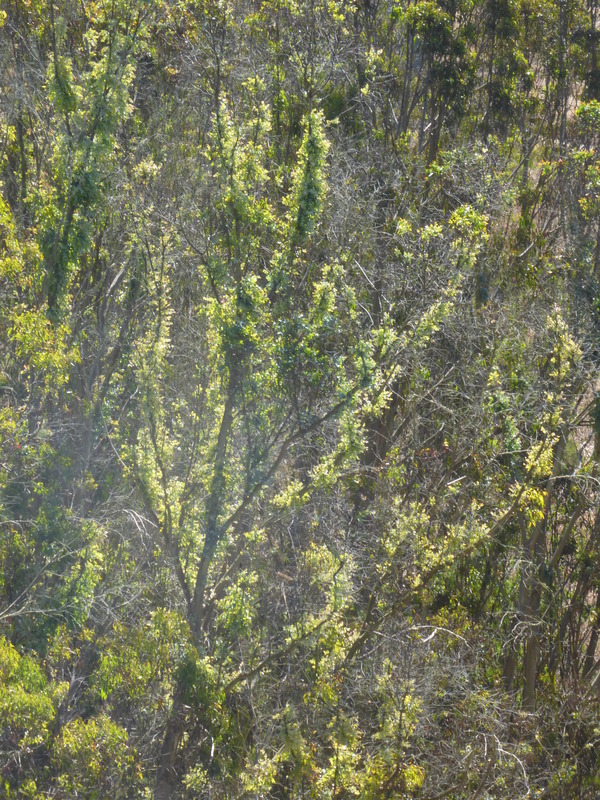 WHAT IS WRONG WITH OUR EUCALYPTUS FOREST IN GLEN CANYON? With more specific information in hand about what Jake Sigg is looking at, we went to see for ourselves. We could see what he was describing from a vantage point on Marietta Drive, west of Glen Canyon Park. We could see lighter colored leaves, but they were more localized than Jake Sigg’s description implied. We didn’t feel qualified to speculate about why the leaves were lighter colored so we recruited an arborist to help us figure out what is happening there. 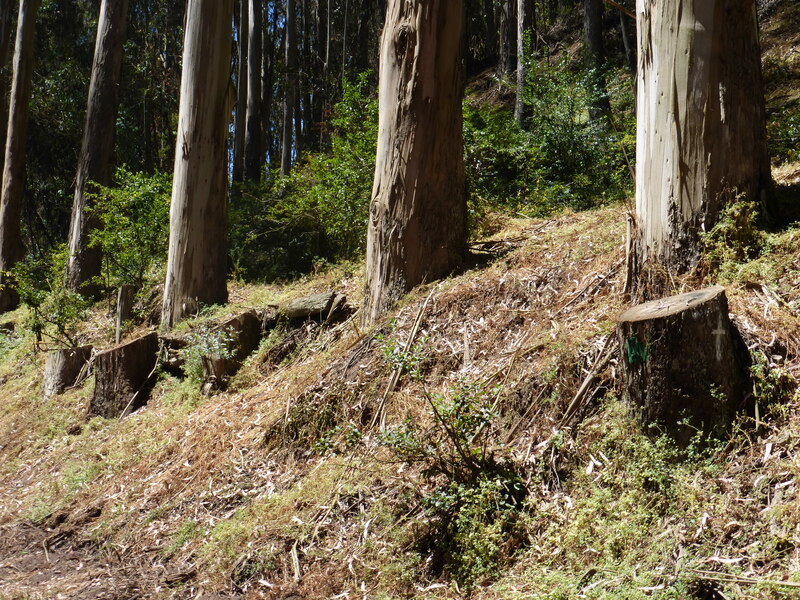 We were fortunate to enlist the help of a certified arborist who has been responsible for urban forests on public lands in the Bay Area for several decades. This is what we learned. The understory of non-native shrubs between O’Shaughnessy Boulevard and the trees with epicormic sprouts has been cleared in the past year. We could see the dead brush piled up next to the trees. We had to wonder how people who claim to be concerned about fire hazard could think such huge piles of dead brush were nothing to be concerned about. We could see the stumps of some of the dead brush and we wondered if the stumps had been sprayed with herbicides after they were cut. Pesticide use reports for Glen Canyon indicate that O’Shaughnessy was sprayed several times in the past year, twice with products containing imazapyr. Imazapyr is known to be harmful to trees if sprayed in proximity to their roots. 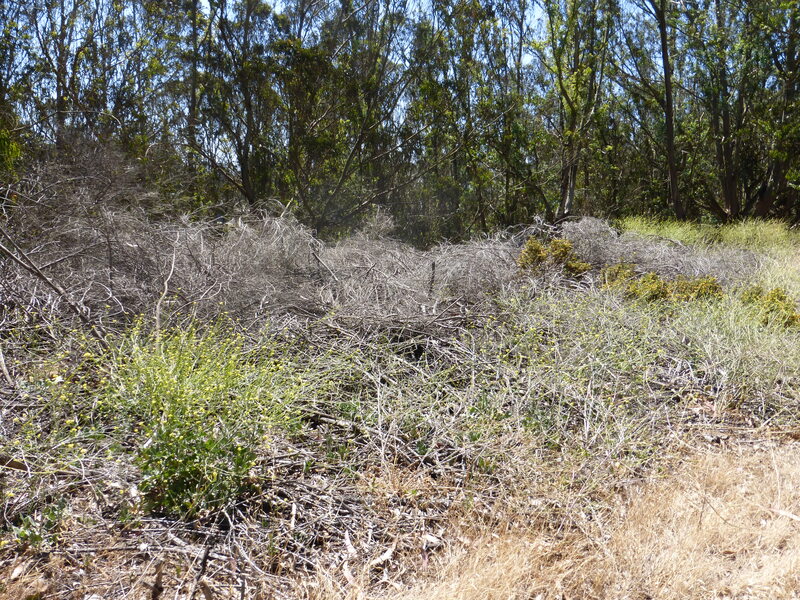 The trees with epicormic sprouts were downhill from the understory shrubs that were destroyed, in the probable direction of water and herbicide flow. We found several trees that had been girdled in the past and are now dead. Then we walked into Glen Canyon Park from its southern end. It’s not a pretty sight. 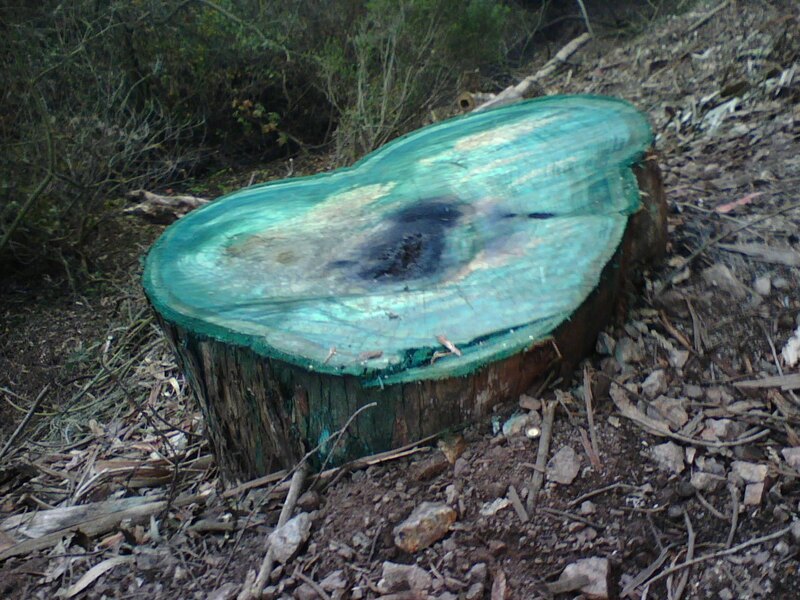 Many huge, old eucalypts have been destroyed. When they were destroyed, their stumps were immediately sprayed with herbicide to prevent them from resprouting. The stumps are simultaneously painted with dye so that workers can tell which trees have been sprayed. The dye is no longer visible, but regular visitors took photos of the painted stumps before the dye faded. The spraying of the stumps do not appear on the pesticide use reports of the Recreation and Park Department. We assume that’s because the spraying was done by the sub-contractors who destroyed the trees. The arborist who walked in the forest with us said, “The painting of stumps with RoundUp or Garlon in proximity to trees that are being preserved can kill the neighboring preserved tree. 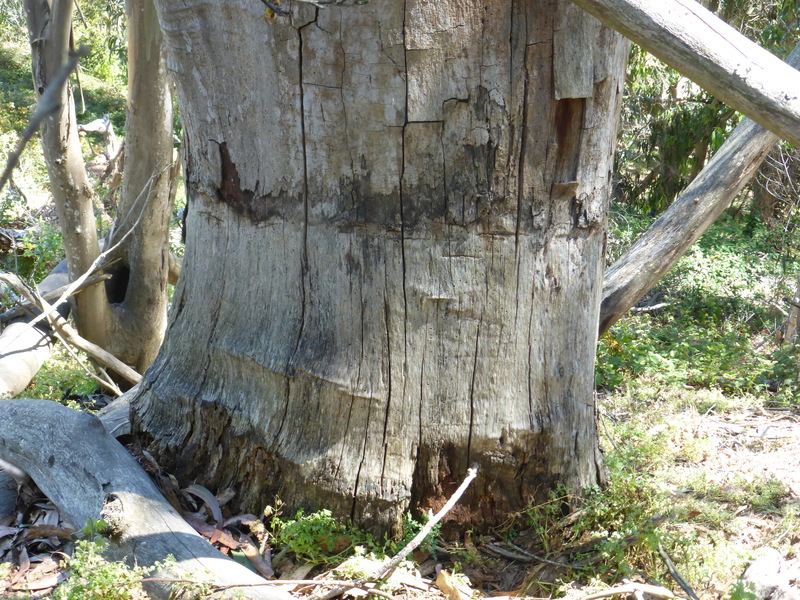 Stumps near living, residual (preserved) trees should not be painted with RoundUp or Garlon if the stumps are within 40’ of mature, blue gums that are slated for preservation.” If the remaining trees are damaged by herbicides, their mature leaves fall and epicormic sprouts will then emerge as the tree recovers. While the trees were being destroyed in 2013, the Natural Areas Program was eradicating non-native vegetation in the Canyon. They sprayed ivy, blackberry, and valerian with Milestone, which is another herbicide that is known to damage trees if sprayed near their roots. In addition to these official applications of herbicide in this park, there is a long history of unauthorized, illegal herbicide applications by “volunteers,” more appropriately called vandals. We saw a lot of epicormic growth in the Canyon, sprouting from stumps that must be cut back and resprayed with herbicides. It usually takes several retreatments to successfully kill the roots of eucalypts that are destroyed. We also saw epicormic growth from eucalypts that had been severely pruned and were also exposed to a great deal more light because they had lost the shelter of their neighboring trees. The trees in Glen Canyon are reacting to the traumas to which they have been subjected: the loss of their neighbors that were either girdled or cut down thereby exposing them to more light and wind, the loss of the shelter of their understory, the application of herbicides known to be harmful to trees. The good news is that there are still plenty of trees in Glen Canyon that have not yet been destroyed and they are in great shape. Here is the view of the tree canopy in Glen Canyon taken from the east side of the park near Turquoise Way. 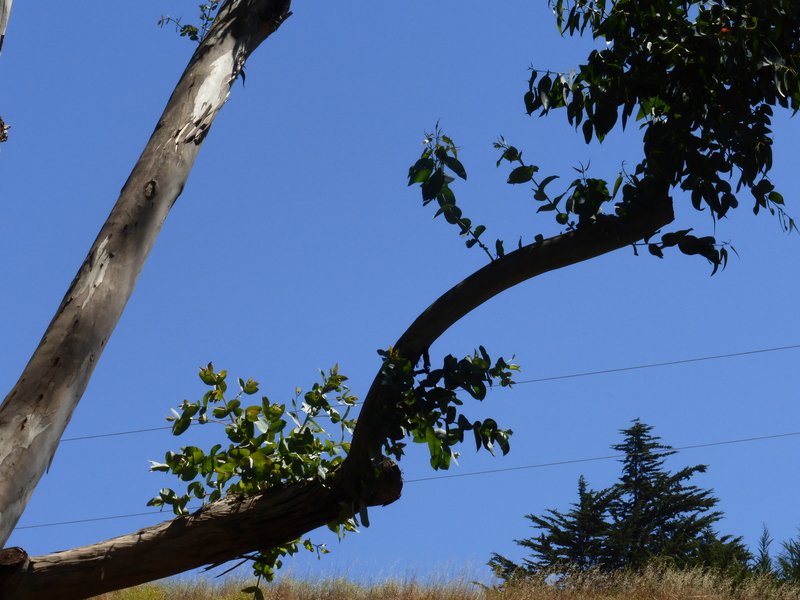 The first picture was taken in December 2012 (before the current round of tree destruction in Glen Canyon Park) and the second picture was taken in May 2014. Same perspective of Glen Canyon tree canopy, taken May 2014. Courtesy San Francisco Forest Alliance. These trees are doing just fine because the Natural Areas Program has not yet gone that deeply into the park. But NAP intends to destroy many more trees in Glen Canyon (and elsewhere) when the Environmental Impact Report (EIR) for their management plan (SNRAMP) is finally approved. Then we will see more consequences of the destructive practices of the Natural Areas Program and we will probably hear more bogus explanations for that damage. We expect the EIR to finally be considered for approval at the end of 2014. We will do whatever we can to convince San Francisco’s policy makers that they should approve the “Maintenance Alternative” which would enable NAP to continue to care for the native plant gardens they have created in the past 15 years, but prevent them from expanding further. We hope that our readers will help to accomplish this important task. 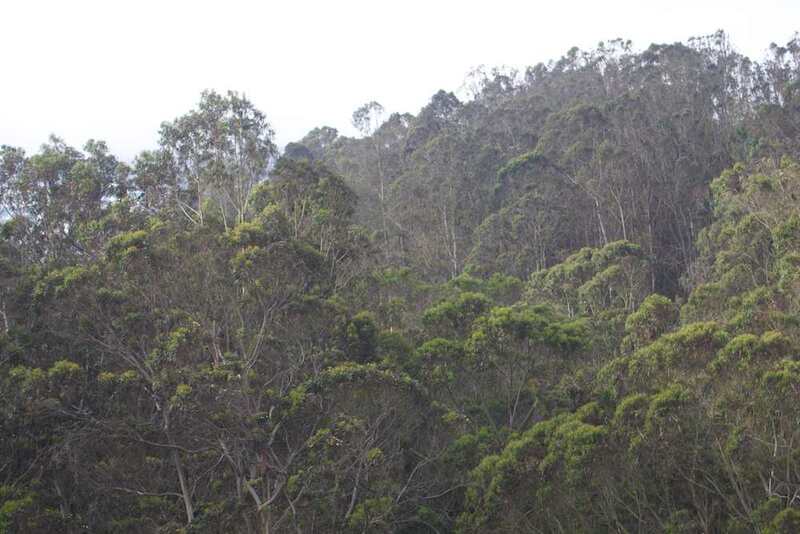 *Jake Sigg’s Nature News of June 10, 2014, introduced the theories of Craig Dawson about the health of the Sutro Forest. Mr. Dawson’s speculations are different from Mr. Sigg’s and we will not address them in those post. Why is their such an attitude to destroy trees that have been there before most of us were here. Is this just sense less destroying of beauty and who is behind it. When the trees are gone what is going to hold the soil??????????????????? 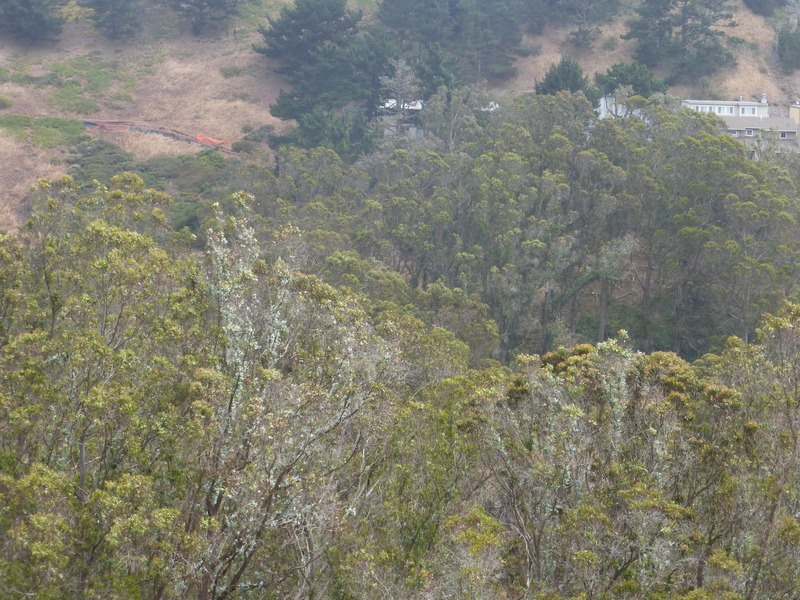 SIGN TO SAVE SUTRO FOREST! Vote NO on Measure FF!! Roundup: Probably Carcinogenic, and What Else?